Updated with sketch: On April 18, 2017, at about 6:00 p.m. at Charter Oak Park in the unincorporated area of Covina, two 10 year old girls were playing near baseball fields where several youth teams were practicing. The girls noticed a man, standing near other adults, staring at them. The girls felt uncomfortable and went to the other side of the park to play. 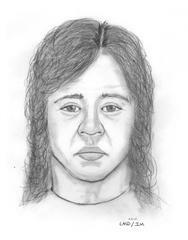 The man entered a car, described as a newer model silver/grey Honda or Toyota, and left the area. Approximately 15-20 minutes later the man returned to the other side of the park and parked his car near the two girls. The man got out of the car and approached the girls, separated from them by a chain-link fence. The man told the girls, “Get in the car.” The girls ignored him. The man became more aggressive and said, “Didn’t you hear me? Get in the car!” The girls became frightened, ran away, and told one of their mothers what happened. The man watched the girls until the mother looked over at him; He then sped off east on Tudor Street toward Bonnie Cove Avenue. During the 15-20 minutes the suspect was gone from the park, deputies received a call of a man exposing himself in his vehicle a few blocks away. The description of the suspect vehicle was similar in both incidents. Suspect: White, male, 30-40 years old, green/light colored eyes, shoulder length wavy brown hair, lips were very pink but believe it was his natural color. Suspect Vehicle: New model 4 door sedan, tinted windows, chrome door handles. Possibly a silver/charcoal grey Honda or Toyota. Parents are reminded to make their children aware of the concept of, “stranger danger,” and provide guidance on what to do in various circumstances. The National Crime Prevention Council provides useful advice on this topic, available at http://bit.ly/2oKTldD.